If your home is close to or more than 100 years old, then it's likely it would have been orginally lined with sarking and scrim. Sarking is short horizontal planks of wood. It was used as part of the wall lining and also formed part of the bracing (now we use dwangs) in old houses. Sarking itself isn't a problem, although if you want to install insulation from the inside you will have to take it out to get the insulation in. Usually the planks are so old and thin they break (you can see a crack in the middle one below) so you can't usually put them back in. That's not an issue though because you'd most likely want to reline with a plasterboard like GIB in which case you don't need the sarking. Bracing is now restricted building work in New Zealand so if you are removing sarking you need to have new bracing calculations done by someone who holds the LBP (licensed building practitioner) design category and have new bracing installed by a LBP carpenter. Most restricted building requires consent from your council so make sure to check with your local council or designer if consent is required. 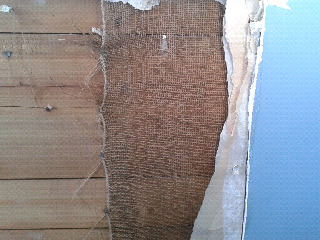 Scrim is like a hessian sacking which went on top of the sarking (in the picture below this one is nailed in, you can see the nail in the middle bottom with what looks like ribbon). The wallpaper was stuck on to the scrim. Scrim is highly flammable and insurance companies often either won't cover or won't give full cover if you have scrim. We suggest if you do find some you let your insurance company know right away as it is better to keep them informed rather than have your home burn down and then find out you don't have cover! 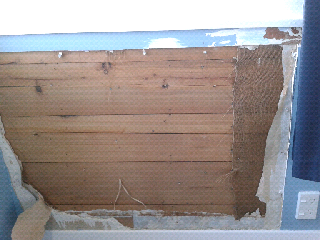 If you just want to remove the scrim and reline yourself you should check with your council if consent is required – if it is then it is very likely a LBP carpenter needs to do the work (in which case it may be worth considering spending slightly more to have insulation installed at the same time).